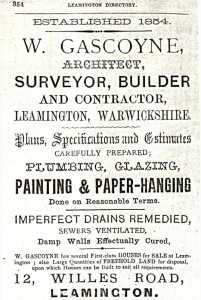 William Gascoyne (1827 – 1902) – A Nineteenth Century Leamington Builder. 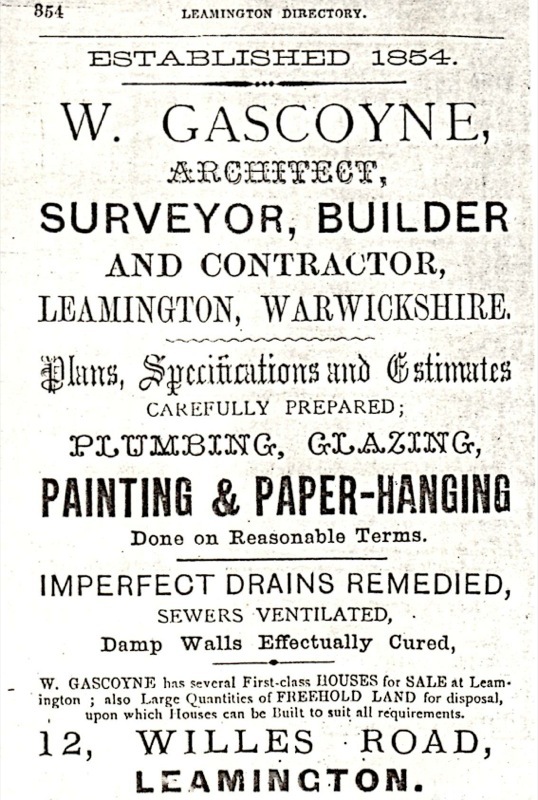 A stonemason by training, William Gascoyne came to dominate the building industry in late 19th Century Royal Leamington Spa. He undertook a variety of projects, in public, commercial and domestic buildings, playing a prominent and important role in the local building industry, and contributing significantly to the life and development of the town. By 1855, local directories indicate that from his building premises in Cross Street, he offered expertise in almost every sector of ‘the building trade, from architectural design to interior decorating. Gascoyne’s business, in a labour-intensive industry, grew rapidly over a relatively short period of time. By 1871, his workforce numbered 96 men and 11 boys. Eventually, the business became a trading partnership involving his sons. From local press reports, William Gascoyne’s early relationship with his workforce was evidently one of mutual respect. On 24 December 1859, Gascoyne entertained his men to ‘good old English fare, which was served upon his premises’. After the meal, the men were served with drinks and entertained until midnight with music from a saxhorn band. The report commented: ‘A thoroughly good feeling is evidently established between Mr Gascoyne and those employed by him’. (Leamington Courier, 31 Dec 1859). In 1863, Gascoyne was actively involved in the establishment of a Sick Fund Society for his employees, run by an elected management committee, with Gascoyne as Treasurer. The first annual report recorded a disheartening start, when three workmen fell ill, but the Society ended the year in a sound financial position and generously agreed to send £5 ‘for the relief of the distressed of Coventry and its immediate neighbourhood’, to which Gascoyne added a further two guineas. Gascoyne was prepared to travel considerable distances to promote his business, undertaking work in London and setting up a branch in Beckenham, Kent in 1867. 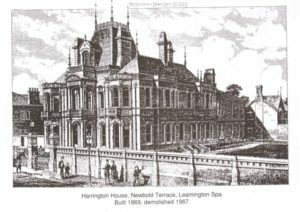 His main area of interest lay in Leamington, where he rebuilt the railway bridge over High Street, laid the main connection to the new irrigation works, extended the boiler house and the softwater tank at the Campion Terrace waterworks. He built the post office in Priory Terrace, to a design by James Williams, and converted the former Bedford Hotel on behalf of the Leamington Priors and Warwickshire Bank. Although not a Catholic, he developed a twenty-year association with St Peter’s Roman Catholic Church in Dormer Place, starting with the building of the church, followed by the presbytery, and later, the tower and spire. In 1879, he built the Roman Catholic Girls’ School in Augusta Place. However, when fire destroyed the church in 1883, Gascoyne was instructed to do the initial repair work, but failed to obtain the contract for the rebuild. A significant proportion of Gascoyne’s building business was based on both contract and speculative house-building, – a sector of the industry which enjoyed a revival in fortune in the late 1850s. 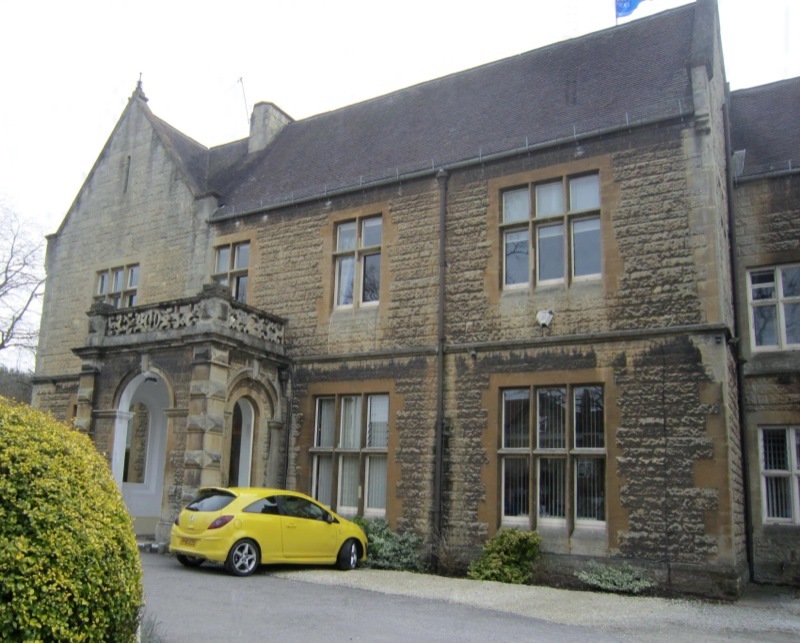 He built expensive villa-type properties in Newbold Terrace and, between 1862 and 1863, Thorn Bank, close to the new railway station at Milverton. The eighteen bedroom, two bathroom mansion Newbold Beeches, and Beauchamp Hall (above, now the Kingsley School), are further examples of his work. 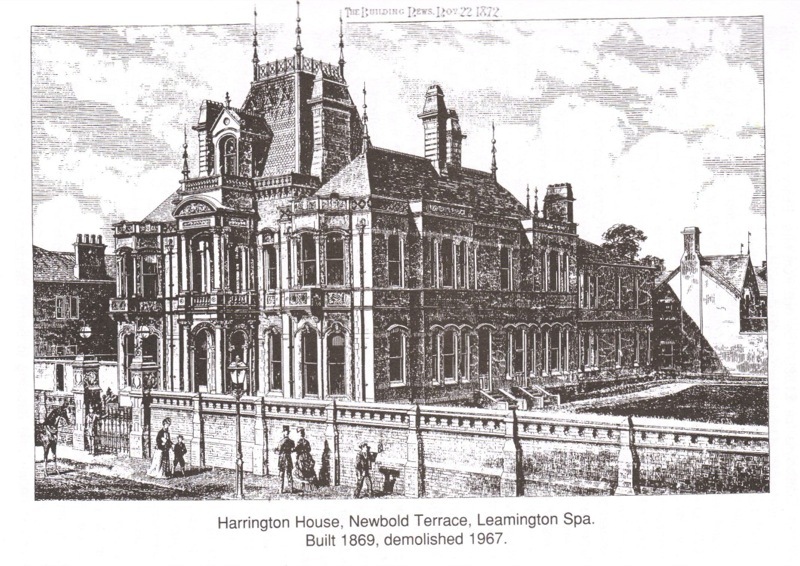 Perhaps the best known was the Newbold Terrace mansion, Harrington House, now the site of the Spa Centre. Harrington House was reported in The Builder in November 1872, to have been designed by Augustus Welby Pugin, with a 10-feet wide stone staircase and marble pillars holding up the roof, a chapel and a billiard room, thirteen principal bedrooms, three dressing rooms and a bathroom. On the third floor were seven sleeping apartments for servants. The ground floor drawing room was 89 feet long by 18 feet wide, and the dining room 28 feet by 18 feet. The commissioning owner, Major Seel, never lived there, preferring the adjacent, more modest Comyn House, also built by Gascoyne. William Gascoyne took great pride in his adopted town and made a significant contribution to maintaining and improving its amenities. He became known not just as a prominent businessman, but also as a member of the Local Board of Health, the Highways, Waterworks and Improvements Committee, and the Police, Sanitary and Gas Works Committee. He was also a member of the management committee of the Pump Room and Grounds. He supported measures to provide access to the many leisure facilities which the town offered and campaigned vigorously for boating rights for ratepayers on the River Leam below Victoria Bridge. William Gascoyne became one of the first town councillors in July 1875, and at the first Council Meeting was elected an Alderman. He served on a number of Council committees, including the one to consider the most suitable site for a new Town Hall. Pressure of business forced him to resign in 1876, but he was re-elected in 1883, resuming many of his old responsibilities. He was instrumental in the decision to house the Free Library in the new Town Hall, in rooms below the ballroom, – where it remained until the opening in 1900 of the purpose-built building in Avenue Road. William Gascoyne resigned a second time from the Council, in January 1885, this time because he had been declared bankrupt in the Surrey County Court, at Croydon – as a result of heavy financial liabilities incurred by his son James, in Beckenham, and poor book-keeping. James left the family business, and emigrated to Australia, where he died in November 1897. From relatively humble beginnings in Leamington in 1851, in a modest cottage at 22 Rugby Road, Lillington, by 1855, William had moved on to build his own large house on what is now Willes Road, with accommodation for a groom, a cook and a house maid. He had separate business premises in Cross Street, later demolished to make way for a row of six cottages. Like many aspirational businessmen of the time, William Gascoyne attempted to become one of the landed gentry. For a number of years, he held the tenancy of two farms in Lillington, Manor Farm and Village Farm, and he was described as a Builder, Contractor and Farmer of 286 acres, employing seven men and four boys. At Christmas 1873, a handsome pig, reared by ‘Mr W Gascoyne, Lillington’ formed the centrepiece of the display in Mr Astell’s butcher’s shop in Warwick Street. An inventory of Village Farm at the time of the bankruptcy records many items associated with a family of substance, – Turkish carpets, carved oak furniture, oil paintings, two four-wheeled carriages, and so on. Sadly, for all his entrepreneurial skills and building flair, William Gascoyne seems not to have been a competent book-keeper. The Official Receiver was very critical of him, – possibly justifiably so. One of Gascoyne’s last projects in Leamington, completed on his behalf by the Trustee appointed by the bankruptcy court was the contract to build the Salvation Army Citadel in Park Street, to seat two thousand people. In spite of a substantial bequest, the project incurred heavy losses and the opening in 1885 by General William Booth, was delayed whilst arrangements were made to secure the balance of the money due. Gascoyne had been a true Victorian pillar of society, until his business failure and bankruptcy turned him into a social outcast. He and his wife Martha spent their final years in Beckenham. Martha died there in July 1889, but is buried in Lillington. William died aged 76 in October 1902, and is buried in Beckenham Cemetery. Although there were appropriate contemporary acknowledgements of his achievements by townspeople and tradesmen and in the press, there is no lasting memorial in Leamington, where he had contributed so much to the social, political and economic life of the town, His undistinguished and untended grave fails to reflect the immense character and achievements of the man. This article is based on a longer article which appeared in Warwickshire History, Winter 1995/6, and is produced by kind permission of the author and editors. ← A Wise Bequest: Henry Wise’s unplanned contribution to the development of Victorian cricket – the Wisden Legacy.